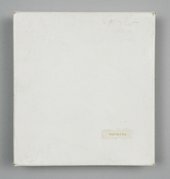 The white square box has a single word in green in the lower right hand corner of its lid, the title of the work: Poinsettia. Opening the box reveals a square frame of thin wood, from which are suspended two Cash tags, the type used for sewing children’s names into school clothing. Instead of names, however, there is a couplet, a poem: ‘My favourite flowers‌ are leaves’. The first line is in green while the second is in red. The labels are suspended from pins embedded in the corners of the frame. 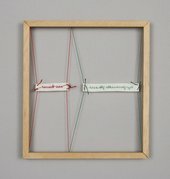 The label in green is suspended on green thread, while the label in red is suspended on red thread. 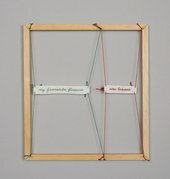 The work has a fragility about it: the lightness of the text is reflected in the lightness of the frame and the space within the work. A poinsettia is a plant native to Mexico, with red and green foliage. In the wild it can grow to ten feet tall but it is also cultivated as a pot plant. In the West it is associated with Christmas. The red and green of the work refer to the foliage of the plant. 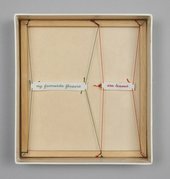 Poinsettia is part of the Tate Library’s artist books collection and by its nature challenges the notion of a book. Tate Library’s collecting policy includes a definition of a book as ‘normally a number of pages attached to each other in some way’, and if one considers the tags as pages, then this work is indeed a book. The book relates to two other works by Cutts held by Tate Library. Made in 1979, the first is also called Poinsettia and incorporates Cash tags with the same text in the same colour arrangement. This time, however, they are stitched on a white card that is in a green folder and placed in a red three-fold wrapper that looks like French windows. Again, the work is small. The second inkwell & paperweight 1992 has the same text printed with the first line in red and the second in green, but this time on delicate thin paper, contrasting with the grey hardback cover of the book. 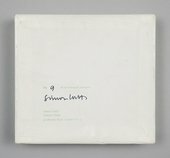 Simon Cutts is an eminent figure in the field of artist books in Britain. As poet, artist and publisher, he has made books since the mid-1960s, firstly with Stuart Mills as Tarasque Press and then as Coracle. Cutts met Stuart Mills, poet and publisher, at the Trent Bookshop, run by Mills and Martin Parnell, in Nottinghamin 1964. They became friends and launched the little magazine Tarasque, devoted to poetry, which ran from 1966 to issue 11/12 in 1970. As well as the magazine, the Tarasque Press published small booklets and cards. These were poetry based but often also included visual material, with works by Cutts, Mills, Ian Hamilton Finlay, Ian Gardner and others. Coracle Press began in South London in 1975. As well as printing and publishing, Coracle has run a gallery space and the bookshop workfortheeyeto. Coracle has published hundreds of printed items, including books, cards and ephemera. Tate Library holds over 150 Coracle works by Cutts and many other artists including Erica Van Horn, Colin Sackett, Thomas A. Clark, Les Coleman, Stephen Duncalf, Andy Goldsworthy, Susan Howe, Richard Long and Stuart Mills. Certain Trees: The Constructed Book, Poem and Object 1964–2006, Saint-Yrieix-la-Perche 2006. Simon Cutts, Some Forms of Availability: Critical Passages on The Book and Publication by Simon Cutts, New York 2007. Printed in Norfolk: Coracle Publications 1989­–2012, Sheffield 2012.